This wonderful Trek in Kinnaur circuits the revered Kinnaur Kailash mountain. Kinnaur was forbidden to trekkers till a few years ago. Consequently these trails have been less used and over explored last about two centuries ago. The Kinnaur Kailash Range borders the Disctrict of Kinnaur in the south and is dominated by the Kinnaur Kailash (6349 Mts) and Jonkarden (6473 Mts) peaks. The only pass on this trek is the Charang La at an awesome altitude of 5300 Mts above sea level .The trek is challenging and also rewarding for experienced trekkers. Kinner Kailash Parikrma is one of the toughest treks in Himachal, around the holy Mount Kailash, also called Kinner Kailash in Kinnaur. One of the most challenging treks in the Indian Himalayan region, the Kinner Kailash Parikrama trek takes you into a deep wilderness of the Kinnaur region in Himachal.It’s a 60 Km trek, which starts in Thangi through Charang, Lalan Ti, crossing Charang La pass (17,194 ft) and ends in Chitkul village - the last inhabited village accessible by road, near the Indo-Tibet border in Baspa valley of Kinnaur, Himachal. it’s a difficult trek and there are no specific directions to follow, just a few stones kept on top of each other by former trekkers marks the path.There is no cellular connectivity here or any villages on the way, so unless you have a compass and a map, or a guide, you’re sure to get lost. It’s a non-touristy, difficult trek and the most difficult part is the climb up Charang La pass. The Kinner Kailash Shivlingam trek will take to the heart of one of the most mythical abodes of Lord Shiva, which is a 79 foot vertical rock in the Kinner Kailash mountain range. On a clear day, one can see the Shivlingam which changes color during the course of the day. This Rock face is in between the 20,000 ft Kinner Kailash ranges of Mt. Kailash (19,850 ft) & Mt. Jorkanden (21,237 ft). Opportunity to witness unmatched scenic beauty of Baspa and Sutlej rivers. Explore 360 degree panorama of Kinner Kailash range. Get the lifetime opportunity of crossing some of the high mountain passes in India, namely Charang La and Kunzum La. Get the opportunity to camp next to flowing streams accompanied with bonfires. Start the tour from Chandigarh Airport/Railway station and proceed to Shimla. It is around 115 km and takes 3-4 hours to complete journey. After arrival, check into hotel take some rest and visit local sightseeing of shimla like Jakhu Temple, Kalibari Temple, Church, Mall Road, The Ridge. In between your visit have lunch And some rest at Hotel Alfa Resturant. After that check into hotel and overnight stay at hotel. After breakfast trip begins with a drive through Narkanda, Kufri, and Shri Bhima Kali Temple in Sarahan Bhushar, Rampur Bhushar, then we will proceed to Jeori (which has hot water sulphur stream and offers stunning views of the valley). In between your visit have lunch at Rampur Bhushar. We will travel mainly on the metalled roads and pass through the thick woodland to reach Kalpa. During this time of year the Apples has a subtle fragrance that is tantalizing. Some of the finest chilgoza and apple orchards are found here. Here, one can enjoy an awe-inspiring picturesque view of the 6050 metres towering Kinnar Kailash range. We will stay overnight in Kalpa in a hotel for some rest and dinner. After breakfast we will drive from Kalpa towards Lambar in the morning, a startlingly stunning destination, situated high on top of an abysmal gorge, with the quaint village nestled atop. We will then come back at the campsite, enjoy to have packed lunch and rest for the entire day at leisure for the acclimatization and stay at camp for overnight. We will commence our trek to the Kinner Kailash Parikrama, in the morning post breakfast from Lambar to Shurting towards the northern east direction climbing the height and following the stream. It is a parallel stroll. Surting is a little high land, here two river watercourses meets together forming the Lambar River. In between your trek enjoy to have packed lunch. An ultra-modern advanced ITBP post located at 3150 meters where your names will be entered with regard to movement of the trekkers. Bonfire and overnight stay in the camp set up in Shurting. This is a parallel hike of about 3-4 Hours. Charang is well-known for its 11th century monastery known as the Rangrik Tungma Complex. After reaching the destination you can explore the spectacular surroundings and indulge in some relaxation and acclimatization. We will stay overnight in the camp located near to a gorge in Charang village. Next morning we trek uphill in the Charang valley and cover 8 kms in around 6 to 7 hours. Lalanti has beautiful meadows with thousands of high altitude flowers. It is a yellow and red vast spread carpet of flowers under an open blue sky with roaring sound of gushing Mountain Rivers adds to the scenic beauty and overall experience. Camp next to stream in Lalanti.This is moderate level of ascending and we will camp below Lalanti Pass. Today is the most challenging and tough day for the trekkers as, during the trek approximately 30 kms will be covered which will take nearly (12 -14 hours). At around 4:00 AM, we will start the trek. It's a difficult climb up to the Charang Pass (5242meters) or Lalanti Pass. Coming down towards the pass is a long portion of strolling. After a walking for all day long we will finish our trek at Chitkul Lalanti. It is a soaring altitude shepherd territory and you can also get to see snow leopard here in the winters. Ibex can also be seen in this area. We will stay here for overnight in the hotel. Rest for whole day and sight seen around the village chitkul. The village chitkul is situated at an altitude of 3500 m is the last and highest village of the Sangla Valley, Chitkul. Beyond Chitkul is the difficult and unwelcoming mountain terrain. Still further is Tibet. 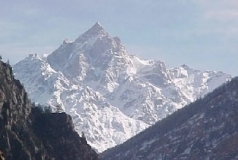 Actually, Chitkul lies in an area that, earlier, was the trade route between India and Tibet. One look at the people of Chitkul will conform this connection with Tibet. The looks of these people as well as the jewelleries they wear reminds of the Tibetan influence. Chitkul is full of variety scenes. You will come across winding and cutting streams, pretty countryside, desnsely forested hillside, alpine meadows and lastly barren mountains. Within Chitkul itself, there are three temples of local goddess Mathi. The main temples here are believed to be built around 500 years ago. After breakfast proceed to Shimla. It is around 262 Km and take 8-9 hours to arrive. The Journey is too long so we will break journey at Rampur Bushahr. Have lunch and some rest there and proceed to Shimla. After arrival Check into hotel and overnight stay at hotel. After breakfast proceed to Chandigarh. It is around 115 km and take 3-4 hours to arrive. Our representative will drop you at Chandigarh Airport/Railway Station. Mall Road Shimla: The Mall Road is the main street in Shimla,the capital city of Himachal Pradesh, India . All colonial structures are located on the Mall Road. The Mall Road is also famous for its wooden furniture shops that sell exquisite wooden articles, which look like antiques. The trek can be commenced between the periods of May to October but, the ideal time is between September and October as before that, the region may face heavy monsoon showers resulting in landslides, avalanches and cloud bursts. According to Hindu Mythology this is a very sacred place in the Indian Himalayas as it is associated with lord Shiva and Mata Parvati. A natural pond/Kund near Kinnar Kailash peak, known as Parvati Kund, is considered to be a creation of Goddess Parvati. She worshipped here for a long time. It is also the meeting place for Lord Shiva and Mata Parvati . For this reason Ganesh Park or Kailash Darshan Park was earlier called Ashiqui Park. Mythology states that Lord Shiva conducted a meeting of Goddesses and Gods at Kinner Kailash peak every winter. This accounts for the Yatra that takes place every year during this time by devotees of Lord Shiva and local deities.